March | 2014 | How to love Igbo things (or what you will). Igbophilia or ‘How to be Igbo in the 21st Century’. Today is the last day for early bird (read discounted tickets) for the 3rd annual Igbo Conference taking place at SOAS, University of London, 2-3 May 2014. Why? Well, the Igbo Conference is a great place to exchange ideas, stories, tips and even learn the language and culture. This year’s theme is on ‘Heritage’ and I am quite excited about the list of activities. But don’t take my word for it. Have a look. For the eagle-eyed amongst you, well spotted. I am part of the panel on the 3rd of May. I will probably be wearing my villain shoes so if in doubt, look for that. I might even bring the Tot. It’ll be great to see you guys there. I must have woken up on the wrong side of my bed or else, Mother’s Day is really starting to grate. As children my sisters and I would strip the church bushes of all their flowers for my mother because yes we loved her, but maybe out of some childish notion of guilt also; to make up for all the nasty things people said behind her back. She didn’t have the same Mother’s Day as all the other women in our church. Our mother was Catholic. We were not. In recent times I have called to wish her a happy day but have done nothing special for myself. Today, I have woken up to a lot of smugness and it is starting to annoy me. Don’t get me wrong, raising a child is very, very hard. Trying-to-crack-a-palm-kernel-with-your-teeth hard. Walking-on-hot-coals hard. Heck some mornings I wake up and wish I was still in labour. Raising a child is especially hard when – like me and so many other mothers here – you don’t have help and are trying to work/working from home. I am not trying to diminish this. But something about today has got my goat. I think that a lot of times in trying to celebrate one group, we isolate lots of others. ‘Being a mother is the most important job in the world’ is starting to sound like it should come with a ‘But’. A friend sent me a lovely message today that ended ‘If God didn’t think you could be a mum, he wouldn’t have let you have kids’ or something. I beg to differ. Have you ever seen a child suffering from drug or alcohol withdrawal? Abused kids? Sexually molested ones? So what am I saying? I am saying that today maybe we should celebrate not just mothers biological or adoptive, but all child-rearers and carers, guardians. We should celebrate people who are trying to have kids, or who have lost the kids they have carried sometimes to term. We should think of ‘aunties’ and’ uncles’ who teach our kids things we cannot because everyone has a special something to contribute to the upbringing of a child. We should celebrate those who teach them to blow bubbles and to paint, those who read to them and watch them so that parents can have a life outside the family unit, those who love our kids and treat them like theirs, those who raise them and feed them and clothes them and pay their school fees when their birth mothers are daunted by the task and their birth fathers have followed their erections out the door, grandmothers and grandfathers who give illegitimate children the protection of their names (in African societies). Let’s celebrate people everywhere who are trying to keep children alive; strangers running from conflict in South Sudan and from heavy fire in Syria. Let’s celebrate those strangers that tried to help children in the Westgate Massacre and those that hid children during the Biafran war and the Holocaust. Maybe we should scrap Mother’s Day and Father’s Day or merge them into ‘Guardian’s Day’. That way we can also celebrate people who chose not to have kids, because without them to keep the balance, Mama Ngozi in my village would not be able to bear the 12 kids she needs for farm work. I’m off. Chores beckon as per usual. But just in case anyone is asking, I would like for the clocks NOT to go forward in the UK on ‘Mother’s Day’. Losing an hour is not my idea of a good time. 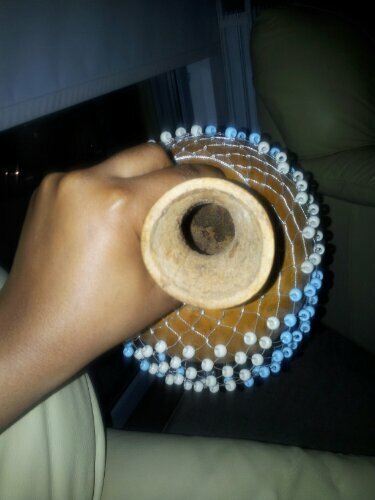 A friend came from Nigeria today and brought along an ichaka for the Tot. It’s a musical instrument, like some kind of inside-out maraca. This one is made with beads but the ones I grew up with are different.Usually the seeds taken from the gourd plant are interlinked with thread into this unique net pattern and attached over the now hollow gourd. 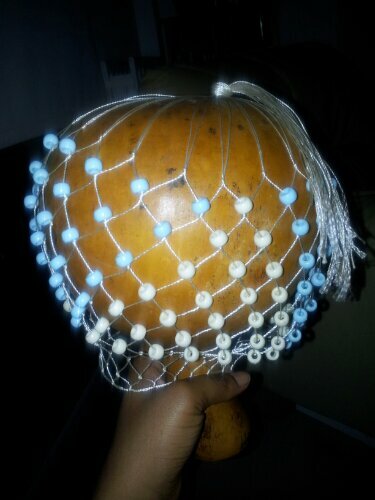 The music produced sounds a bit like a maraca when its made from the seeds of the gourd. These plastic beads are a lot louder. 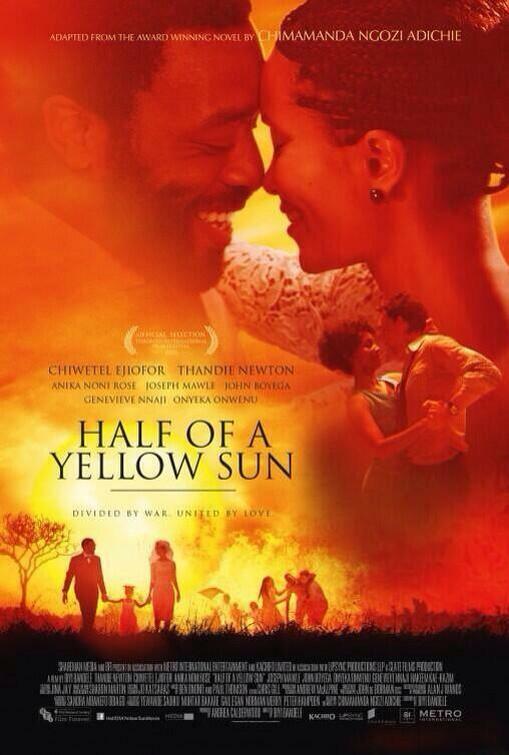 Still a few tickets left for the FREE screening of Half of a Yellow Sun. So apparently the quiz I set for the free tickets to the Half of a Yellow Sun film screening at the ICA in London was too hard. Thank you to all those who sent emails. Odenigbo is a character in which book? 4) Half of a Yellow Sun. Remember, this is for a free ticket to the screening of the HOAYS film on Thursday the 20th of March. I will post to anywhere in the UK. A friend asked me ‘What’s the difference between Ngwo-Ngwo and Nkwobi?’ and I didn’t know what to tell her having never tasted Nkwobi before. When I moved to London a few years ago it was all ‘Nkwobi-this’ and ‘Nkwobi-that’ and I approached it in the same way I do all faddy things – which is not at all. I have never tasted Nkwobi. “You can make Nkwobi right?” Trying to contain the drool pouring out of his mouth. And failing. Needless to say, when I lived in Enfield, women – and they were always women- who could make Nkwobi were almost always elevated to superstar status. And even then I did not taste it. Even though it looked the same as Ngwo-ngwo. I could not understand the frenzy. Na jazz? You can imagine how flabbergasted I was to realise that my suspicions were correct. The two are more or less the same. Hiss. For those who do not know, this is a spicy dish made from goat or cow foot and/or tail, palm oil and in some cases goat brain. Mmmmmmmm….nice creamy brain. My mother never used the brain though and she would often scoop it out when she was making Isi Ewu – another delicacy involving a goat’s head. *Just FYI, few things in life are as satisfying as scooping out a goat's mushy brain through a gash in the temple after it has been roasted. It looks like a cross between porridge and cottage cheese but it smells so divine! This is something my mother would knock out from boredom which is probably why I am so blasé about it. I guess she was a superstar too. My father’s friends would eat it and drink palm-wine, laughing into the night while we forced our child-eyes to stay open so as not to miss any gossip. Some people would say Ngwo-Ngwo differs from Nkwobi in that the former can and does contain other parts of meat/offal as well as the aforementioned limbs and I suppose that could be correct. But I think this is splitting hairs a bit because ultimately they are both based around the same bits of animal and the technique is the same. Anyway, I just finished a serious discussion on the subject (yes, this is a serious matter. Take note if you are married to or friends with an Igbo person because this is the stuff wars are made of!) and got sent a video. Can I just be the first to say that this girl’s accent is making me all warm and fuzzy? I just want to marry her. Is she not the friendliest person you have ever not-met?